I am researching my family history and have come across my ggggreat uncle who served in the 11th Bn Border Regiment. He was 27744 Pte Farmer F(red). Can anybody expand on his military career. I'm lead to believe he served in Gallipoli before moving to the Western Front and eventually dying on the Somme in Nov 1916. Can anyone help me further. He was born in Rhayader, Radnor and resided in Nantmel,Radnor. He enlisted (into the Hereford Regiment, as Pte. 8254) at Rhayader. I don't know when he transferred to the Border Regt. He was KIA on 18th November 1916 (the "last day" of the Battle of the Somme) and has no known grave. He is commemmorated on the Thiepval Memorial to the missing. If you get hold of his MIC (probably available online at the NA website), you should be able to find out his date of entry overseas and where (possibly confirming or otherwise his Gallipoli service). Also, if you take a look at the "mother" site to this , under "Grandad's War", you'll find other research suggestions, and you can also find a "in a nutshell" account of the 11th Bn's war service within their division, listing battles partaken in. Interests:Primarily Pte Fred Farmer who served in the 11th Bn The Border Regt but also served in the King's Shropshire Light Infantry and Herefordshire Regt. Many thanks for your reply. I have managed to download a copy of his medal cards from the NA website. It appears that he served with the KSLI inbetween service with the Herefords and the Borders. I intend to approach the KSLI museum in Shrewsbury to see if I can glean abit more information on his service in Gallipoli. Many thanks once again. I've just read Blindfold and Alone-about the capital courts martials of the war and other disciplinary matters and in there was a passage about the Lonsdales.After suffering badly on July 1st-some survivors apparently refused to go on a trench raid(30 out of 90 had reported sick),and their medical officer agreed they were unfit,due to their grevious losses only 9 days previous. I've just finished reading Richard Holmes's book Tommy where page 470 also makes a mention of this incident. The RMO Lieutenant G.N. Kirkwood was dismissed for over empathising with soldiers under his care. "Sympathy for sick and wounded men under his treatment is a good attribute for a doctor, but it is not for an MO to inform a CO that his men are not in a fit state to carry on a military operation.The men being on duty in the front line should be proof that they are fit for the duty called for." Not sure if you are still doing Border Regiment Look Ups,but if you are I would appreciate any Mention of 5831;QMS/WO2; Richard Thomas Balcombe 8th Battalion,The Border Regt. No mention in the index. If I come across him in the text at any time, I'll let you know. Cheers Dave I live in hope! As per my announcement - I'm no longer doing "look-ups" on this thread. Have recently acquired a copy of the History. 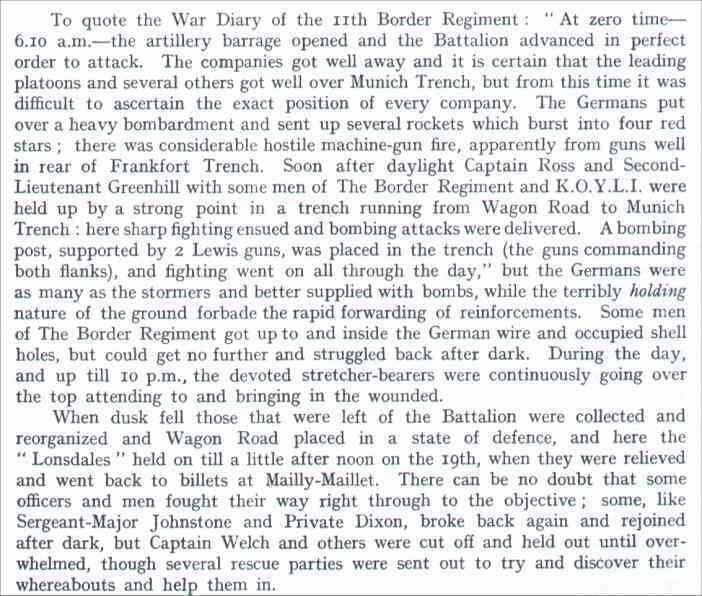 I am new to this forum and new to researching my great grandfather's history in the 11th Battalion Border Regiment. His name was John Bardgett and he was a L/Cpl, 15309. He was killed in action on the 1st July 1916 and I was wondering if you had info or could tell me anything about him. I am also after a history of the Border regiment in general and interested to find out what happened on that particular day when he died. Any suggestions on where to star looking? I would be most grateful for any info you could pass on. I am also after a history of the Border regiment in general and interested to find out what happened on that particular day when he died. Naval & Military Press Ltd publish a reproduction of the Regimental History "The Border Regiment in the Great War" at £22. It should give you a good account of the day as well as accounts of the 11th Battalion's time on activce service before this. It may also be well worth you contacting the Regimental Museum @ Carlisle Castle. They have an excellent database of soldiers who served (particularly the early recruits like John). Although very friendly and helpful folk, they are understaffed so don't expect a particularly quick response. "The Border Regiment in the Great War" is possibly one of the dullest reads know to man. As a source it is invaluable, but I can’t help thinking that a half decent researcher/writer could have added a little ‘life’ into it. Probably about to be shot for saying so. Still, get it, look things up in it, but never never try to read it from cover to cover. "The Border Regiment in the Great War" is possibly one of the dullest reads know to man. Colonel Wylly certainly churned the several he wrote to a formula. None are a great read. But all are packed with useful infomation - particularly about major engagements. I rather wish he'd done the Cheshires' one. Won't get shot from me for saying that Dave! I find the same case with most "official" regimental histories and, therefore, have never attempted to read one cover to cover. Same with War Diaries (on which many of the histories are based anyway) - anything that deals with pure facts (as they saw them!) tends to be a little dull, but are unbeatable for reference. (on the opposite side of the coin, "entertaining" histories can sometimes lose a little factually, I find). (on the opposite side of the coin, "entertaining" histories can sometimes lose a little factually, I find). Indeed. One only has to look at "With the Manchesters in the East" (Pt. 1 of the 7/Manc story). Very chatty and damn all use to the researcher. Can’t help feeling that if the good colonel had just interviewed or added some correspondence from those who actually took part in the events, the whole thing could have been so much better. Thanks for your speedy response, I shall try and hunt down the publication you mentioned. In fact i'm after a few different books to get a wider idea as i have so little understanding of what actually happened. I know there are a couple of books that i want to get about the Border Regiment, one being Lonsdale Battalion 1914-1918 by Colin Bardgett (who I actually met in 2004). Aparently it's a difficult book to get hold of but i'm going to try all the same. I've been to Carlilse Castle, again in 2004 when i went to the record office there. Is it in the same or different building? I don't get much chance to go up to Cumbria, sadly. Thanks for the advice, will bear that in mind but i'm always open to books that are new to me, particularly if it's for research purposes. I'm hoping there will be something in it i can use, even if it's for background info. The museum is in a different building within the castle grounds. It's off to your right as you go in. Give them a ring and see what you can sort over the phone ( they may have the Lonsdale book you mention for sale). Thanks John, will do that. I think I need all the help I can get. There is surprisingly little in print that I can find about the Border Regt. I know/have plenty on pre-WW1 and some on WW2 and beyond. But the Great War seems a little parched for information. As for the Lonsdales, I only know local lore and legend about them. I’m a Carlisle lad, as were my fathers before me. Do know a chap who metal detected around the race course on Blackwell Road and found two Lonsdale cap badges. moving slightly 'off thread' do you have much on the 1st Border in the Boer War as my Grandad was with them and I am always on the lookout for more info? Seem to remember photos showing various rifle companies and platoons. A diary that was privately published just before the Great War. Even architectural plans of houses built in Carlisle for old soldiers. Mostly, at my father's home near Carlisle, so I’ll need a trip up there to sort it out. Happy to dig them out for you when I get a chance during my next visit - which should be soon. If I find anything useful or interesting i'll let you know, i'm keeping an eye on this particular thread! I'm sure there has to be something out there, what are you looking out for, something specific or general? Apart from a couple of books that have been recommended and what i've seen on the internet to buy, i've found nothing useful online specific to the Lonsdales. I guess i'd like to search the newspaper archives but that would be a mammoth task and i'm not quite sure where to start. I know i need to plan another trip up to Carlisle and Keswick. It's the little personal stories i find so fascinating and i know of other people who have been succesful with the newspaper archives...thought it'd be a good idea. I just need to find the time to do it! I'd be very interested to know about the local lore and legend of the Lonsdales though. Hope you can help with information on Ernest George Dowdell. He died on 22nd March 1918 at the Battle of the Marne. 2nd Lt. 3rd Bn attd 8th Bn, Border Regt: awarded MC. 20th London Regt 2403 Private, then Border Regt (DocumentsOnline). David N Dowdell has piece of shrapnel taken from Ernie's knee - believe this wound to be the one mentioned above. Had a young lady - Muriel Westerton - apologised to her for going to certain death.